Sometimes I come across China-Africa links that may not have caught many reader's eyes. With a bow to Chris Blattman, I'm going to institute a new practice of "Links I Liked" to bring these to readers' attention, in addition to my own original blog posts and commentaries. 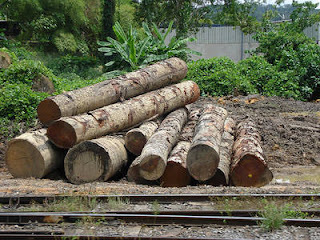 "Dialogue between IFIA and Asian operators in the Congo Basin forestry sector" (May 22, 2008). This rather dry sounding title describes a fascinating workshop held in May 2008 in Libreville, Gabon, on responsible forestry activities. The Congo Basin Forestry Partnership and the Inter-African Forest Industries Association met with Asian (mainly Chinese and ethnic Chinese) companies active in the forestry sector. The Germans sponsored it all, with the intention that "dialogue, of course, should particularly include the new arrivals, not necessarily aware of all of the region’s efforts and progress in promoting sustainable forest management." The Chinese were interested, particularly in the business realities of certification. Some 80 people attended the workshop, including many "new arrivals" -- people from Beijing but also the local Chinese embassy, Chinese companies CAITEC, TBNI, LGG-Gabon, WWF-China, Sinopec, China Eximbank -- as well as dozens of Gabonese and non-Gabonese environmental associations. Meet Ms Li Kun, a representative of COFCO, a major Chinese corporation with 850,000 hectares of forestry concessions in Gabon. She describes COFCO's plans to obtain Ecocertifor Véritas certification for their products, their use of MICRO BOIS traceability and exploitation follow-up software. The COFCO Group in Gabon currently employs more than 530 people, 80% of whom are Gabonese nationals. For more on Chinese extractive activities in Gabon and DRC see this excellent report by Swedish scholar Johanna Jansson. H/T to Eric Olander at China Talking Points (and to Johanna). I am just catching up with your blog and I am amazed at all the new, thoughtful and useful content. Your energy is quite something. Thanks for the blog! Thanks also for linking to the report. I did some later field work in Gabon in 2010 in collaboration with Brainforest, Cifor and the Swedish Institute of International Affairs on forestry, mining and fisheries, never managed to make much of the data beyond the report for Cifor since I started my PhD shortly afterwards, but I wrote an update for Pambazuka: click here. DB adds: Some of the Cifor research has been published as part of a series on the impact of Chinese trade and investment on forestry in Africa: See it here.